While on vacation this summer I finally read Cutting For Stone, and I loved it. Most of you have probably already read this book, or at least know what it’s about. So, instead of talking about the plot, I will tell you all the reasons I loved the book. 1. Getting lost in a chunkster. On vacation I felt like reading a big story that I could sink my teeth into and dwell in for a while. Often I feel like I’m reading in a hurry, because I have library books to return and more books to read. But, for this one I just took my time and enjoyed it. 2. The setting. It mostly takes place in Addis Ababa, Ethiopia. Far away and exotic, with so much culture to learn about. 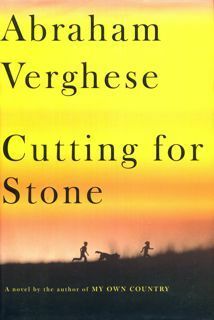 Verghese filled his book with details of time and place, including tidbits of the political unrest that occurs in the timeframe of the novel. He also highlights the differences in America, in comparison to Ethiopia, when Marion finally ends up there. Things that we are used to felt so strange to Marion at first. It was as if nothing I’d ever done in my life prior to this counted. As if my past life was revealed to be a waste, a gesture in slow motion, because what I considered scarce and precious was in fact plentiful and cheap, and what I counted as rapid progress turned out to be glacially slow. 3. Sister Mary Joseph Praise and Dr. Thomas Stone. There were some unique, unforgettable relationships happening in this book, theirs being one of them. This storyline could have been a cliché (a nun who gives birth), but their characters were so well imagined and brought to life that I enjoyed their short background story almost as much as the rest of the book. Although these two characters end up dying or disappearing early on in the story, we still get to know them as well as the rest of the characters, and their presence continues to be felt throughout the book. 4. Marion and Shiva Stone. The relationship between the brothers was beautiful, complicated, and painful all at the same time. From the miracle of their conception and birth to Marion’s life threatening disease at the end, we get to experience their individualism and the bond that continues even after death. According to Shiva, life is in the end about fixing holes. Shiva didn’t speak in metaphors. Fixing holes is precisely what he did. Still, it’s an apt metaphor for our profession. But there’s another kind of hole, and that is the wound that divides family. Sometimes this wound occurs at the moment of birth, sometimes it happens later. We are all fixing what is broken. It is the task of a lifetime. What I owe Shiva most is this: to tell the story… Only telling can heal the rift that separates my brother and me. Yes, I have infinite faith in the craft of surgery, but no surgeon can heal the kind of wound that divides two brothers. Where silk and steal fail, story must succeed. 5. Hema and Ghosh. Hema and Ghosh are the doctors that become Shiva and Marion’s adoptive parents. And, they are wonderful parents. The twins couldn’t have done better. Here, too, is another of the book’s unforgettable relationships. We could all learn a little something from Hema and Ghosh about both marriage and parenting. 6. All of the wonderful secondary characters. Matron, the nun and head nurse who was there for everyone through thick and thin; Rosina, the twins’ caregiver; Genet, Rosina’s head-strong daughter, the love of Marion’s life, and the driving force behind many disastrous events; Almaz, the fiercely loyal cook of Hema and Ghosh; plus many more. 7. Medical details. Depending on your interests and squeamishness, some of you might not agree with this one, but I, for one, loved all the details in this book about illness, surgery, and other medical details. Often it was quite graphic. I learned many new things, including differences between Ethiopia and America in medical practices, available resources and equipment, and types of illnesses commonly being treated in both countries. 8. The story. This is a story of what-ifs. The sequence of events are all hinged on each other, and many of them might easily have been avoided. Sometimes stories like this drive me mad, but for some reason, this one was beautiful. Maybe because there was so much more to the story than the plot-changing events. Or, maybe because we know that, in the end, the protagonist has made it to the other end of the book, well and able to tell his story. I am forced to render some order to the events of my life, to say it began here, and then because of this, that happened, and this is how the end connects to the beginning, and so here I am. 9. The ending. Oh, the tears. But, somehow the ending seems just right, like it couldn’t have ended any other way. Read it for yourself and see! 10. The writing. 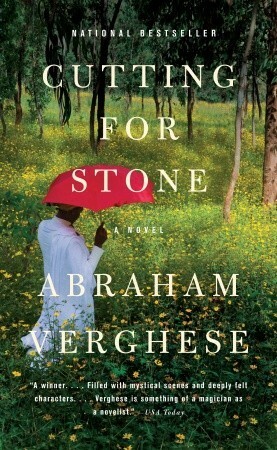 Abraham Verghese is both a wonderful storyteller and writer. I was immersed in his story from the first page until the last. I am curious to know what he will write about next. Check out Abraham Verghese’s website to see just how talented this man is! Aah, I read this book last year and I had the same experience as you…just falling into another country and time, it was lovely. The relationships were awesome too. I couldn’t help loving Ghosh. Such a great dad and husband! Exactly. I loved reading about their lives in Ethiopia. And, you can’t find anyone more likeable than Ghosh! I enjoyed this book, particularly the parts set in Ethiopia! Yes, I loved learning more about Ethiopia. I’m pretty sure I must be one of the last to read this book! I hadn’t heard of this but it sounds wonderful, the writing you have quoted is gorgeous! Sometimes it’s good to take time over a book…. It is wonderful, I highly recommend it. And, it does feel good to take my time on a book every once in a while. I guess that’s what vacation is for! I loved it too. Such great characters. Thank you for reminding me about this novel. It was on my list when it first came out but somehow vanished amidst the shelter of everything else I wanted to read. If I order it from the library now there shouldn’t be a waiting list and I can get round to finally reading it. That happens to me all the time. It can be a good thing sometimes, though. No wait list at the library! Happy reading! Talk about covers having an impact. The two covers are so different. Just looking at the top cover and not reading the blurb on the book, I would not guess that the setting of the story was Ethiopia. And yet the first cover with its green lushness would seem to be more inviting. It is interesting how the cover of a book can impact whether I will read it. I think so, too. I often judge a book by its cover. For this book, the copy I had was the green one, which I loved, but the whole time I was reading it, I was trying to figure out who the man on the cover was supposed to be. I came to the conclusion that it didn’t have anything to do with the book. I loved looking at it, though. Someone should do a post on book covers that match the story, and vice versa. I used to work in a public library. One of the things that was interesting is how many people chose their fiction based on the cover and the colors on the cover. I’ve actually never heard of this book until reading your review! It sounds like a gorgeous book though. I’m fascinated with “what ifs” and books with wonderful, unforgettable characters will always draw me in. Plus, I’m always looking for a book that will make me cry 😛 I’m off to go learn more about this book now! Yes, yes, yes!! I was reluctant to read this book, but once i started the rest of my life had to be put on hold. It was brilliant. YES!! I haven’t read it yet either, Naomi! 🙂 I got this at a local library sale last year. I had no idea, really, what it was about, only that enough people had said it was amazing. Now I know someone personally who feels the same way! I am very encouraged, and can’t wait to read this! Oh, you will love it, I am sure, Cecilia! Or, at least, I hope now that I have said you would. If you read it, let us know! This one is on my Kindle. I should probably get to it!